Before I start this blog post recipe, let me tell you that this is might tasty! I look for shortcuts in the kitchen, especially when I am making a late night dinner and want to prepare something quick and easy yet delicious and not out of a box. This recipe is for all my newbie cooks out there! 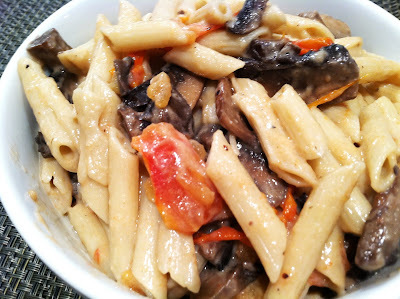 This is my secret version of a light creamy alfredo sauce with savory portabello mushrooms and tomatoes. When I find a really good product like Newman's Own Alfredo Pasta Sauce, I like to keep it on hand for nights just like this since I don't always have cream on hand to make my own sauce. Add in fresh sauted vegetables and you have a delicious meal in minutes. I have also included my no-fail Quick Alfredo Sauce which is absolutely delicious. 1. Cook the pasta al dente, according to the package, drain and pour back into the pot. 2. In a saute pan, over medium heat, melt the butter (or oil) and garlic. Add the mushrooms and saute until the mushrooms are almost done for about 3 minutes, add in the tomatoes for another minute. 3. To the pasta, add half a jar (or more!) of the Alfredo sauce and toss lightly. Add in the mushrooms and tomatoes and toss. 4. Serve immediately in individual serving bowls with little Parmigiano-Reggiano cheese on the top. 1. Bring 1 cup of the heavy cream and the butter to a simmer in a medium saucepan over medium heat, reduce the heat to low and simmer gently until the mixture reduces to 2/3 cup, 12 to 15 minutes. 2. Off the heat, stir in the remaining 1/2 cup cream, salt, pepper, and nutmeg. 3. Add to the pasta and add in a little of the pasta liquid if you need to. Tip: This dish is delicious with shrimp or chicken added.